22nd March 1917, aged 33. Son of Thomas Knight, of Hawkesbury Rd., Westmead, New South Wales, and the late Charlotte Knight. Born at Sofala, New South Wales. 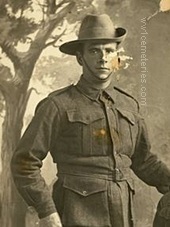 A miner before enlisting in February 1916, Pte Knight left Australia for England with the 6th Reinforcements in April 1916, and arrived in France for service on the Western Front in September 1916. He was killed in action at Beaumetz on 22 March 1917 when a German shell exploded on top of the machine-gun position Pte Knight was manning with three other men. He was buried nearby, but the cross marking his grave was lost, and consequently he had no known grave. 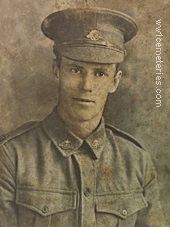 The portrait of Pte Knight was kept in the roof cavity of a Sydney home for 40 years before it was recently discovered. 18th September 1918, aged 31. From Granville, NSW. An Engineer's mechanic prior to enlisting, he embarked from Sydney aboard HMAT Euripides (A14) on 31 October 1917. While on patrol, he was killed in action at Bellicourt, France on 18 September 1918 and buried nearby, aged 31. Post war his grave was not located. 7th April 1918, aged 27. Son of Oliver and Martha Lassey, of Neville, New South Wales. A labourer prior to enlisting in March 1916, Pte Lassey embarked from Sydney with the 4th Reinforcements on board HMAT Vestalia (A44) on 11 July 1916. He arrived in France for service on the Western Front on 21 November 1916 and was transferred to the 19th Battalion on 3 December. Pte Lassey was killed in action at Hangard Wood, near Villers Bretonneux. 25th July 1916, aged 38. Native of Leek, Staffordshire, England. A Carpenter prior to enlisting, he embarked from Melbourne, Victoria, on board HMAT A20 Hororata on 17 April 1915. 15th July 1916, aged 28. Son of James and Catherine Lochhead, of 5, Bendigo St., Burnley, Victoria. Born at Richmond, Victoria. 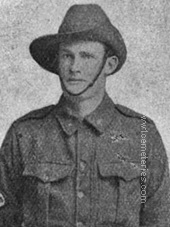 ​A 27 year old baker prior to enlistment on 24 July 1915, he embarked for overseas with the 7th Reinforcements of the 23rd Battalion from Melbourne on 26 November 1915 aboard HMAT Commonwealth. He was killed in action near Fleurbaix, France. ​25th April 1918, aged 29. 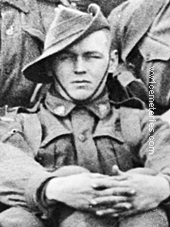 A winchman from Semaphore, South Australia, prior to enlistment, he embarked as a Private (Pte) with the 15th Reinforcements of the 10th Battalion from Adelaide on 9 March 1916 aboard RMS Mongolia for Suez. On 20 May 1916 he was transferred to the 50th Battalion which relocated to the Western Front, France, during June 1916. Pte Lyall was wounded in action near Noreuil on 2 April 1917 and was evacuated to Boulogne for treatment before rejoining his unit later that month. 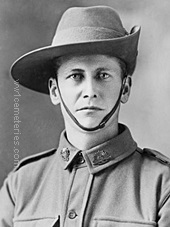 Pte Lyall was appointed Lance Corporal on 5 November 1917. He was wounded in action on the 2nd occasion near Dernancourt on 5 April 1918 but, was able to remain on duty. L Cpl Lyall was killed in action at Blangy-Tronville on 25 April 1918. He has no known grave but was originally shown as being buried at Adelaide Cemetery, Plot III. H. 25. in 1919. Between 22nd July and 25th July 1916, aged 26. Son of Theophilus and Mary Brodie Macdonald, of 8, Isabella St., Balmain, New South Wales. Born at Sydney. 3rd May 1917, aged 35. ​Husband of Mrs Dorothea Harriett Madden, 61 Tinning Street, Brunswich, Victoria. 29th September 1918, aged 32. Son of David and Nancy McCandless, of Warren Cottage, Port Stewart, Co. Derry, Ireland. 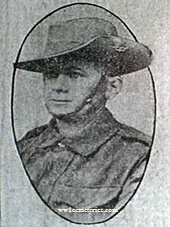 A farmer prior to enlisting in the AIF on 5 February 1916, McCandless embarked for overseas with the 5th Reinforcements from Melbourne on 14 March 1916 aboard HMAT Anchises. Wearing the rank of Acting Sergeant for the voyage, he reverted to Private on arrival in England and was later promoted to Lance Corporal, then to Corporal and to Sergeant before being court martialled and reverted to Corporal. He was wounded in action on 26 September 1917 near Bellicourt, France and died of wounds on 29 September 1917. Between 22nd July and 25th July 1916, aged 23. Son of William James and Margaret McMillan, of Maitland St., Abermain, New South Wales. Born in Midlothian, Scotland. 11th April 1917, aged 22. ​Son of Samuel and Ellen Martin, of Meenaar, Western Australia. Born at Northam, Western Australia. From Meenar Siding, near Northam, WA. 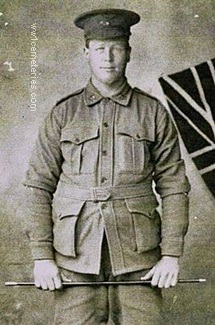 A farm hand before enlisting on 26 April 1916, Pte Martin embarked from Fremantle on HMAT Suffolk with the 6th Reinforcements on 10 October 1916. He was killed in action at Noreuil near Bullecourt on 11 April 1917, when he was hit by a piece of a high explosive shell while on gas guard in a dug-out. Son of Campbell and Charlotte Augusta Mehaffey. Born at Narracoorte, South Australia. 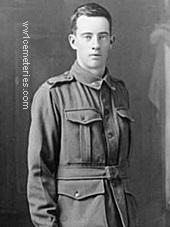 A 21 year old clerk prior to enlisting on 4 August 1915, he embarked for overseas as a Private with the 11th Reinforcements of the 10th Battalion from Adelaide on 27 October 1915 aboard HMAT Benalla. Following further training in Egypt, he transferred to the 50th Battalion and was promoted to Corporal in March 1916. After arriving in France, he was promoted to Sergeant in July 1916. Sgt Mehaffey was killed in action at Noreuil, France, on 2 April 1917 and buried in the Military Cemetery at Noreuil. However, after the war his grave could not be located. ​Son of Samuel A. and Katherine Moore, of 46, Mary St., Unley, South Australia. Born at Adelaide. From Unley, South Australia. A printer prior to enlisting on 2 August 1915, he embarked for overseas with the 12th Reinforcements of the 12th Battalion from Adelaide on 2 December 1915 aboard RMS Malwa. 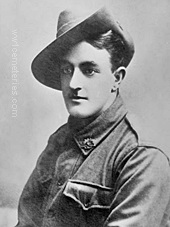 Following further training in Egypt, he transferred to the 52nd Battalion and proceeded to France where he was killed in action at Mouquet Farm on 4 September 1916. His younger brother, 2741 Pte Clement Horace Moore served with the 10th and 50th Battalions and was killed in action at Passchendaele, Belgium on 26 September 1917 and is commemorated on the Menin Gate Memorial. 6th August 1916, aged 18. From Parramatta, NSW. A mechanics fitter prior to enlisting, he embarked from Sydney aboard the HMAT Star of England (A15) on 8 March 1916. He was killed in action near Martinpuich, Somme, France on 6 August 1916, aged 18. Post war his body was not recovered. 27th March 1917, aged 20. Son of William and Elizabeth Murray, of Murray Hill, Warracknabeal, Victoria. Reinforcements from Melbourne on board HMAT Suffolk (A23) on 1 April 1916. After further training in in Egypt his unit arrived in France for service on the Western Front on 30 June 1916 . On 6 October 1916 Pte Murray was transferred to the 58th Battalion. Twice mentioned in despatches for bravery as a runner, Pte Murray was killed in action on 27 March 1917 at Lagnicourt, France. He was 20 years of age. Pte Murray's older brother 1379 Temporary Sergeant George Alexander Hugh Murray, 14th Battalion, was killed in action at Hebuterne, France, on 30 March 1918, aged 25 years and buried at Gommecourt Wood New Cemetery. 3rd May 1917, aged 25. Son of Thomas G. and Edith T. Northey. Born at Melbourne. FromNorth Fitzroy, Vic. A clerk prior to enlistment, he embarked with the 10th Reinforcements from Melbourne aboard HMAT Wiltshire on 7 March 1916. 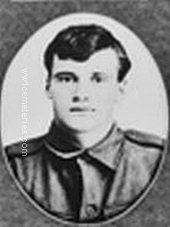 While serving in France, Pte Northey was killed in action during the Second Battle of Bullecourt on 3 May 1917, aged 25. 25th April 1918, aged 21. Son of Samuel Gascoyne Norton and Sarah Ann Norton. Born at Forest Range, South Australia. 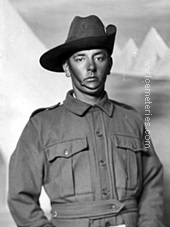 A labourer from Forest Range, South Australia, prior to enlistment, he embarked as a Private with the 7th Reinforcements, from Adelaide on6 November 1916 aboard HMAT Afric (A19) for Plymouth England. Following training in England and a bout of illness he joined his battalion on the Western Front near Ploegsteert, Belgium in mid-July 1917 and was appointed Lance Corporal a month later. 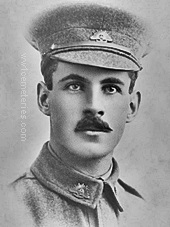 L Cpl Norton was killed in action at Villers-Bretonneux, France, on 25 April 1918. 26th August 1916, aged 23. Son of Samuel Trevillion Pearce and martha Mary Perace of Boisdale, Victoria. Born at Wendron, Cornwall, England. A native of Cornwall, England, Pte Pearce was a labourer from Boisdale, Vic prior to enlistment and embarked with A Company from Melbourne on HMAT Ulysses on 10 May 1915. Initially reported as missing in action, it was later reported that he had been killed in action on 26 August 1916, aged 23, and had been buried at Mouquet Farm, France. 9th August 1916, aged 30. A labourer prior to enlisting on 21 September 1915, Pte Peck embarked from Sydney, NSW, aboard HMAT Suffolk on 30 November 1915. He was killed in action at Bullecourt, France.
" Casualty was killed at Bullecourt on the 9th August 1916 as he was going back from No Man's Land. It is supposed that he was wounded at the time. However, he was accidentally shot by our own machine gunners as he was returning. His body was almost cut in two across the chest." Son of Mrs M Plunkett, Holyoake, Western Australia. A labourer prior to enlistment, Pte Plunkett embarked from Fremantle, WA with the 13th Reinforcements on board HMAT Borda (A30) on 17 January 1916. Pte Plunkett was reported missing and killed in action on 16 April 1917. 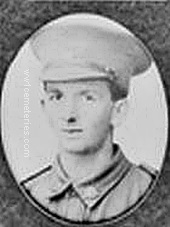 His brother, 1127 Sapper (Spr) John Punkett, C Company, 3rd Australian Tunnelling Company died. Spr. Plunkett is buried at the Fosse No. 10 Communal Cemetery Extension. Lieutenant Pockley's original grave, which was later to be lost. 30th March 1918, aged 26. Son of Frank Antill Pockley and Helen C. Pockley; husband of Nancy J. Pockley, of York St., Sydney. 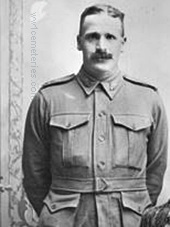 A farmer from Wahroonga, NSW prior to enlistment, Lt Pockley originally embarked with the rank of Private with the Hospital Transport Corps from Sydney on HMAT Orsova on 14 July 1917. After serving on the Hospital Ship Karoola, he returned to Australia and was commissioned as a Second Lieutenant. He re-embarked for overseas service with the 7th Reinforcements, 33rd Battalion from Sydney on HMAT Anchises on 24 January 1917. Later promoted to Lieutenant, he was killed in action on 30 March 1918. Following the Armistice, his grave could not be located and he is commemorated on the Villers-Bretonneux Memorial. His brother, Captain Brian Colden Antill Pockley was the first officer killed in the First World War and is buried at Rabaul (Bita Paka) War Cemetery. 1st January 1917, aged 21. Son of Margaret Pooley, of 5, Normanby Avenue, Malvern, Victoria, and the late John Pooley. Born at Springdale, Victoria. A 20 year old warehouseman prior to enlisting in the AIF on 24 February 1916, he embarked for overseas as the Company Sergeant Major of D Company (service number 1267) from Melbourne on 20 June 1916 aboard HMAT Runic. He was promoted to Warrant Officer Second Class on 26 April 1916 and appointed a Second Lieutenant (2nd Lt) on 19 August 1916. On 1 January 1917 he was killed in action near Armentieres, France. On 1st january 1917, Second Lieutenant Pooley and 16 other men went on a raid of the enemy trenches. Pooley was hit and sent up a S.O.S. signal to open a barrage on the enemy, the signal attracted the German fire and John Pooley was, according to an eye witness, "absolutely riddled with bullets and killed outright." Only 6 men returned from the raid. "I saw 2nd Lieutenant Pooley caught in the barbed wire, and I saw him shot where he was and we all tried to disentangle his body, but could not, and we had to leave his body there. This happened at Armentieres." ​11th Bn. Australian Infantry, A. I. F.
25th July 1916, aged 25. 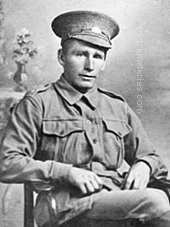 Pte Porter was born in Ireland and emmigrated to Australia with his family aged 5 years. 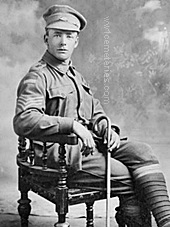 A farmer of Highbury, WA, he enlisted at Narrogin on 7 September 1914 and sailed from Fremantle with H Company on 2 November 1914 aboard HMAT Ascanius. Whilst serving in the Gallipoli campaign he was wounded and evacuated to England for medcial treatment, later rejoining his regiment in France in early 1916. 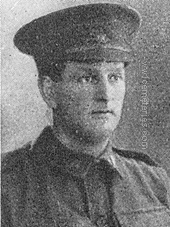 Pte Porter was killed in action during the advance at Contalmaison, on the Pozieres Front, on 25 July 1916, aged 35. 2nd Pioneers, Australian Infantry, A. I. F.
5th October 1918, aged 24. Son of C. and Amelia Rayner. Born at Footscray, Victoria, Australia. 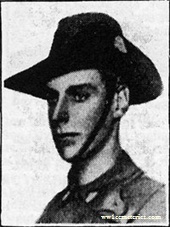 Pte Rayner was killed in action on 5 October 1918 while taking part in the battle around Montbrehain, the last infantry action of the First World War in which Australians took part. 4th June 1918, aged 23. Son of Thomas and Louisa Reardon. Born at Mundoora, South Australia. 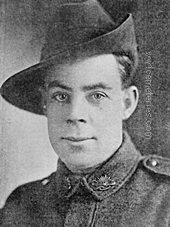 A farm labourer before enlisting in June 1915, Pte Reardon left Australia for Egypt with the 10th Reinforcements in September 1915 and arrived in France for service on the Western Front in April 1916. Pte Reardon was listed as missing after the 10th Battalion moved into the line near Merris, France, on 4 June 1918. 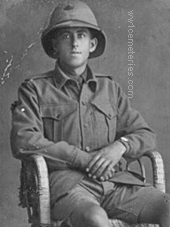 According to his Red Cross Wounded and Missing Enquiry Bureau file, Pte Rearson was last seen mildly wounded from a German hand-grenade and walked to the nearest dressing station, but was never seen again. He was later listed as having been killed in action, aged 23, and has no known grave. Dougal Neil Rentoul, M. C.
2nd Div. Signal Coy. Australian Engineers. 3rd May 1917, aged 22. Son of Margaret McDougal Rentoul, of 22, Poplar St., Caulfield, Victoria, and the late Alexander Rentoul. Born at Deniliquin, New South Wales. From Deniliquin, NSW. An overseer in the canister trade prior to enlistment, Lt. Rentoul embarked with the 20th Battalion, from Sydney aboard HMAT Berrima A35 on 25 June, 1915. 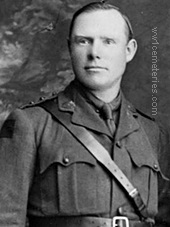 He was awarded the Military Cross on the 2 August 1916 for Gallant Conduct in the field. Nearly a year later he was killed in action in France. A number of eye witness reports mention that he had somehow managed to get in front of the barrage as the infantry was advancing and was hit by a shell and injured, he was caught on the barbed wire in front of the German lines and remained there all day. Where, due to the constant machine gun fire, was riddled with bullets and killed. 15th April 1917, aged 22. Son of Thomas and Mary Ridley, of Abermain, New South Wales. Born in Victoria. His brother Thomas Ridley, MC, DCM, also fell. 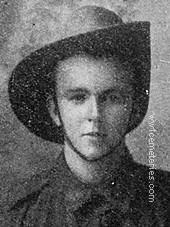 A miner from Abermain, NSW prior to enlistment, Pte Ridley embarked with D Company from Sydney on HMAT Benalla on 1 May 1916. Whilst serving in France the following laudatory was placed on his record "Volunteered to accompany Sgt O'Connor on night of 13th inst. Into No Man's Land and showed conspicuous gallantry. The G.O.C. desires to convey his appreciation of the fine example of courage displayed." Later transferring to the 17th Battalion, he was killed in action, aged 22. His brother, Lieutenant Thomas Ridley, MC, DCM was also killed and is buried at St. Sever Cemetery. 26th November 1916, aged 22. Son of Thomas and Martha Robinson, of 207, Elephant Lane, Thatto Heath, St. Helens, Lancs, England. 3698 Private Roy James Gladstone Burr (sitting) and 3743 Private Sam Robinson. 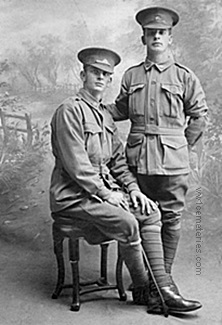 Both enlisted in the 12th Battalion in August 1915. 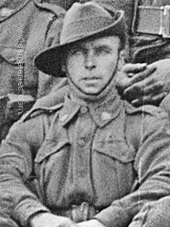 Pte Burr was a labourer from Eudunda, SA. 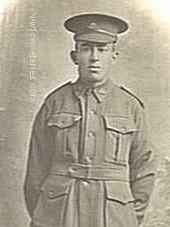 Pte Robinson, was an engine cleaner from Wallaroo, SA; formerly of Shropshire, England. Both embarked from Adelaide aboard RMS Malwa on 2 December 1915. They arrived in Egypt in January 1916 and in March both were transferred to the 52nd Battalion. Pte Burr was appointed Driver in May 1916 and arrived in France on 12 June. 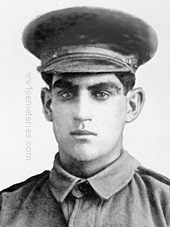 He was reported wounded and missing in action at Mouquet Farm, Pozieres, France, between 3 and 4 September 1916. It was later confirmed that Driver Burr had been killed in action. He was 25 years of age. Robinson was transferred to the 24th Howitzer Brigade and arrived in France on 13 June 1916. 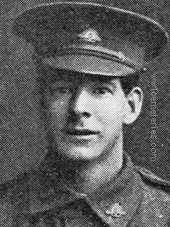 Gunner Robinson was killed in action on the Somme on 26 November 1916. He was 22 years of age. He has no known grave and is also commemorated on the Villers Bretonneux Memorial, see the following page for full details Villers-Bretonneux Memorial ROH A-D.
24th Bn., Australian Infantry, A. I. F.
5th August 1916, aged 23. Son of Edward Rogerson, Roadlands, Cheltenham, England. A Farmer from Burland, Kyneton, Victoria, he embarked from Melbourne, Victoria, on board HMAT A20 Hororata on 27 September 1915. 5th June 1918, aged 23. Son of Charles and Katherine Romeo, of Hastings, Victoria. He originally enlisted on 11 September 1914 at the age of 20 only to be discharged on 5 October 1914 as "unlikely to become an efficient soldier." At the age of 22, he re-enlisted on 28 September 1916 and embarked for overseas with the 23rd Reinforcements from Melbourne on 23 November 1916 aboard HMAT Hororata. While serving on the Western Front, he was wounded in action at Zillebeke Bund, Belgium on 20 September 1917 and evacuated to England for medical treatment. After recovering from his wounds, he returned to his unit in France on 23 December 1917. 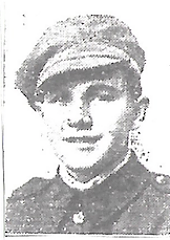 Pte Romeo was killed in action near Strazeele, France. Between 13th March and 14th March 1917. 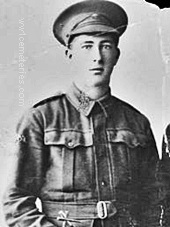 Theodore Rooke was a labourer at Fremantle prior to enlisting on 13 January 1916. He embarked from Fremantle with his battalion on 6 June 1916 aboard HMAT Suevic (A29) and spent several months training at Larkhill Camp, England, before arriving in France in November of that year. Pte Rooke was reported missing in action on 14 May 1917, following a raiding party at Armentieres on the night of the 13th. According to Rooke's Australian Red Cross Missing and Wounded file, it was reported by a fellow soldier that "In the Armentieres Sector at 11.30pm, we attempted a raid on German Trenches. Some of us reached the parapet and then owing to severe shelling were ordered to retire; Rooke was last seen leaving the German trench". 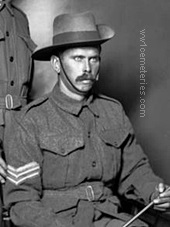 Emigrated to NSW Australia in 1912 and joined 9th Batt. A.I.F. in January 1915. He served at Gallipoli and then on Western Front with 45th Batt. A.I.F. and was killed at Mouquet Farm on 22nd August 1916. His name appears on Plaque 61 70 of this Memorial, on Panel 140 of National War Memorial, Canberra and on Dingwall War Memorial – his home town in Scotland.